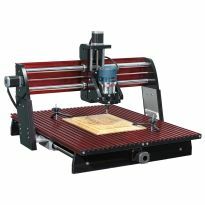 A full-featured mini CNC with a compact 12'' x 18'' table and an included touch-screen interface. Included software means you're ready to start machining as soon as your shipment arrives! Although its attractive price might suggest an entry level machine, the CNC Piranha Fx® Base Model is every bit as capable as its CNC Shark® cousins and it even includes a convenient touch-screen interface! 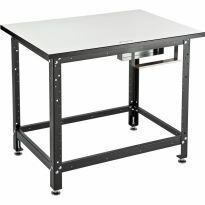 Its compact 12'' x 18'' table makes it perfect for smaller-scale projects like carvings, plaques, ornamental boxes and precision parts machined from wood, soft metals, or plastics, all at a fraction of the price of a full-sized CNC. It is fully compatible with the optional Fx accessory modules (sold separately). With its 3D carving capability, including a 3D models library, you can carve expensive corbels, cut intricate inlays and engravings. 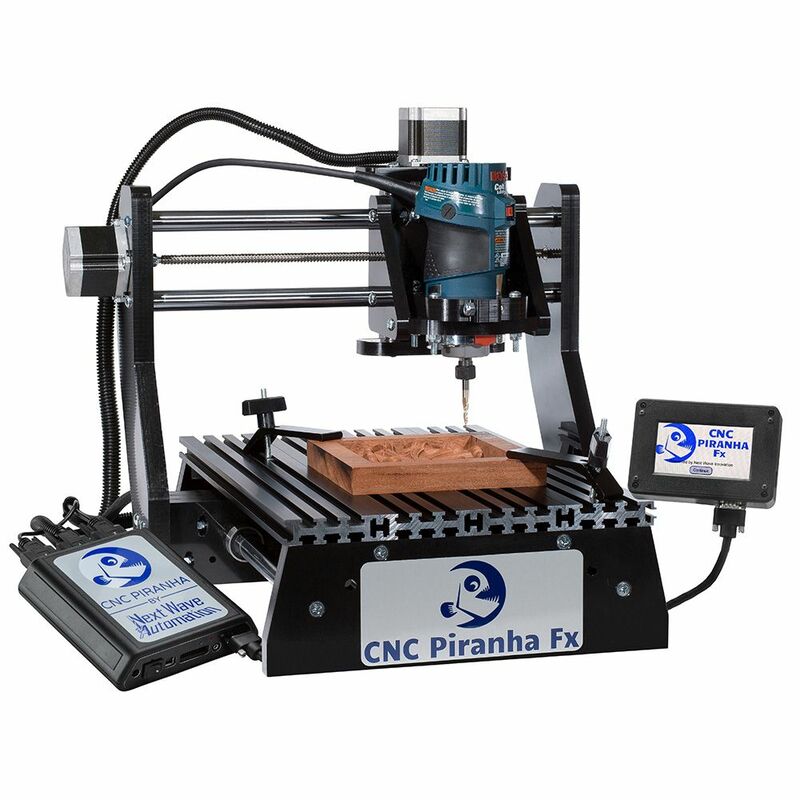 The CNC Piranha Fx® Base Model has such incredible accuracy that you can engrave custom circuit boards with it. In addition, the entire machine can easily fit on one end of your bench. Design your project with the included VCarve Desktop V9.5 Design software on a PC computer with USB 2.0 port or higher (computer not included). Then save your project directly to a USB flash drive, plug it into the Pendant, select your file, and hit the run button. By using the flash drive, your computer won't be subjected to a dusty shop environment. Put the power of the Piranha to work for you today! 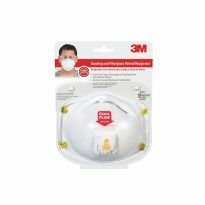 There is an additional $65.00 shipping charge for this item. Router shown in image above is not included. Included router clamps fit the Bosch, Dewalt, and Porter Cable compact routers. If you have received prior versions of VCarve, they are upgradeable to version 9.0. 15% Restocking fee on all CNC Shark returns. This little CNC Machine performs at a professional level! The VCarve software is simple to use and comes with numerous tutorial videos. I have only had it a few weeks but so far it has been perfect. 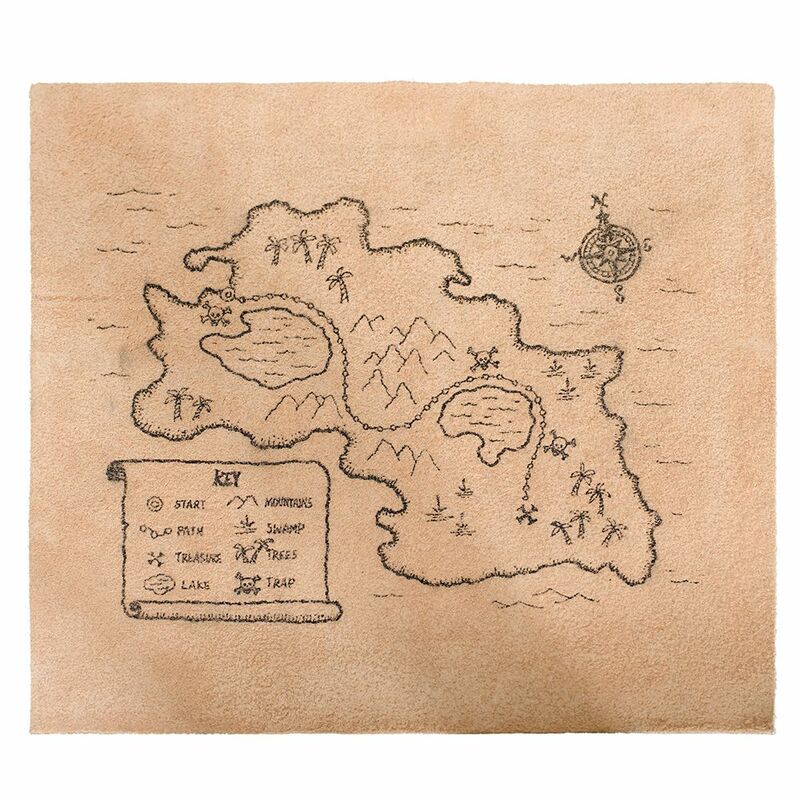 It is only limited by its maximum project size (12” x 13”). I’m very happy with this purchase! My first encounter with CNC machines was watching torpedo casings being created 30+ years ago at a defense contractor. This is very different, but no less interesting. 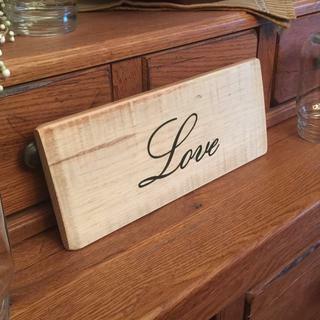 I'm creating signs, boxes and crafts very quickly and learning a ton as I go. The Vectric software is excellent, but you need to put in the time to learn it and expect to make plenty of mistakes (this coming from an engineer making a living writing software for 30+ years). Your clamps will take a beating, your router bits will need cleaning and/or replacement and you'll enjoy figuring out how to improve every aspect of your projects. After owning this for 6 weeks I just gave a simple demo at our local woodworking club which generated a lot of questions and comments. Great little CNC that I would buy all over again. Excellent CNC machine for smaller jobs! Great quality! Great machine! It’s a good machine for the beginner cnc owners. I’m excited to learn more and see its full potential. Will be a fun tool once mastered. Machine is awesome, only step learning curve for this old dude is the program. Lots of you tube videos to help. Went to Rockler's in Altamonte for the first time on Sunday. Knew I was going to get into trouble when I walked in. Browsed the whole store and then came across this. Didn't know about them, didn't research them, just bought it on a whim. Just made my first project and am absolutely amazed. Not gonna lie, this may be the best toy I ever bought myself! This took me a little while to get the hang of but customer service was great and answered every question I had. Really enjoying this product. Without a doubt 5 star product. The controller box and pendant are enclosed and shop friendly. Thumb drive keeps laptop out of the shop. I had a positive experience with customer service and received a free controller replacement due to a burning smell that I didn’t think was normal. Great ! 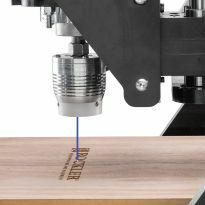 I love this little CNC once I learned the software and watched the excellent I use it a lot. 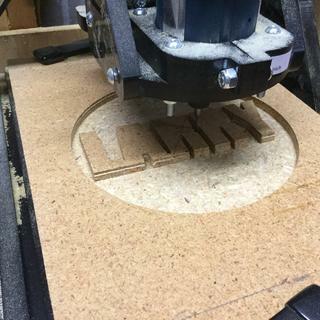 I make cutting boards, cheese slicers, and Coasters so this CNC is perfect for me. After a month the serial connector to the control went bad but after an email to New Wave Creations I had a new cord at no cost in 2 days GREAT SERVICE! As a newbie to woodworking, I am surprised at how quickly I am making parts. My first project was difficult and over my head, but I kept the costs down by working in pine. Made several parts over, but it was not the fault of the machine. It worked fine. I am very pleased and highly recommend the Piranha Fx. Quite pleased with Xmas purchase! A bit of a learning curve... have made many gifts and see this as an ideal starter machine. The vectric software is phenomenal! I'm still getting use to the system. Needed help with the controller and Next Wave Automation was great getting me up and running. Still learning about all the parts I can make for my wooden toys, loving it more each day. I used to do G-Code programing for large CNC Machining Centers and this is such a hoot getting back into CNC machining. Tool is pretty much as advertised. Very accurate and easy to get used to the software. The touch screen works much better using an eraser point rather than fingers. The clamp for the router needed some modification to keep it from slipping but overall it's a good tool for the money. I would also invest in the vacuum attachment- really keeps the dust from going everywhere. This machine works like a charm. The Vcarve software makes it a snap to create unbelievable results. I highly recommend the piranha fx. I downloaded the free version of Vcarve the day I ordered the machine and it shorten the learning curve to almost zero. There are hundreds of video tutorials to help you maximize your results. So far this machine has been great. Very smooth and precise. Rockler, Next Wave and Vectric have been extremely helpful! Tons of training videos too that are very helpful. The reason I purchased this CNC from Rockler was because of David in the Tech department. He talked to me at length and gave me tons of helpful advise which led me to have confidence in Rockler and there Tech department. Thank you! Stay away from the edges of the working area. Bump it and you lose sync with program. Needs switches? Pay attention to speeds and feeds. Could push part out of alignment or lose sync with program. Otherwise great machine, learn to use it slowly!! Excellent machine precision. Great software support. I was amazed at the precision of the cutting that the tool does. Being a novice to CNC, I had a few software questions once I got the basics down and the Vectric staff were very responsive and accurate in their suggestions. Sky is the limit with this machine. Works well. Need to learn all the ins and outs of the software. But it is a good machine, especially if you are just starting out. I've had some great success with mine. Had some issues at first with the control panel software and dealing with Next wave's support for some issues I had, but they finally came through and all is good. The Vectric software that comes with the machine is a bit difficult to use if this is your first time, so I would highly recommend you watch the training videos on their (Vectrc) WEB site ahead of time. Happy camper now! Good activity for an old timer (72 yrs) to learn new things. Time will tell how much I learn about cnc. I am enjoying the new discoveries. We get along fine with the machine but we have some trouble in moving files, etc. We do not have much experience with this type of machine, although we design with AutoCAD. Overall I feel it is an excellent machine that does excellent work. Haven't tested my laser yet, waiting on the cable. May give ya 5 stars when that works. Product is good. The software takes a little getting used to it if you haven't used a software product like this before. I actually love the machine but it does have a few quirks. The working area for the machine is 12"x13" but 2" of it is hanging out of the front of the bed so you have to build a platform to extend the bed if you are working on something more than 10". The wirings from the controller to the motors seems really flimsy and can easily come off if you are not careful. The controller can't seem to read some of the newer USB flash drives. Having some issues is fine if the maker of the machine have a great customer service but they don't. I sent them an email asking why one of my motors stopped working and I had to turn the machine off and on to activate it again and I still have not gotten an answer yet. It has been three weeks since. Buying the machine is the easiest part. Although I have only had the machine for a short time, I have spent what seems endless hours trying to learn the Vcrave 8.5 software. The problem, in my opinion, that there is no adequate documentation to teach someone how to use the program. Yes, there are videos to watch from the Help file, but they seem to omit the very basic instructions needed by someone who has no experience or knowledge of this program. They tend to speed through the steps without thorough explanation. I have looked at a lot of videos from YouTube, without these I would have gotten no where. I have not been able to find any book sources, at book stores or on the internet. Local Rockler classes have been limited and are in the seminar format. Rockler employees have been helpful in things such as how to make a waste board. As I can find no documentation for such a basic need. I have good computer skills and have learned many various types of software, but they all had adequate documentation. What is needed is a good book, "Vcarve/Piranha for Dummies". Simple step by step instructions. I hope you have many hours to spend learning how to use this and have an understanding wife/partner. It has potential. The machine is great, the tech support not so much. The power supply was dead when I originally got it and they quickly replaced it. However when the same problem popped up 10 months later I have had a difficult time getting any help. It took them over two weeks just to reply to the support email and I'm still waiting on a resolution almost a month latter. Have been wanting to do small projects. This is perfect! I have been making jewelry boxes and Japanese puzzle boxes for years. Would like to “personalize “ some in the future. As a novice cnc guy, I like the price and functionality. Did a lot of price/features comparing before choosing the Piranha. The included Vectric software is a bonus. After research, it seems like the best alternative for the price. It has a decent size of work area, and strong build. This is the one my husband wants. He researched & compared several other brands & decided on this one. Great price! Big enough for my hobby jobs. It was a good deal and I have always wanted one. As much as I'd like a big CNC, I'm out of shop space and this is big enough for the boxes, signs and other crafts I currently work on. When I'm ready to move to something bigger (workshop or CNC) I'm sure I'll find a way to keep this productive. Seems to be a good value for the money. The workspace is adequate for my needs and the accuracy is great. The included Vectric software is powerful and easy to learn from the trial download. learn about CNC machine capabilities and some small projects that i may want to be able to duplicate. 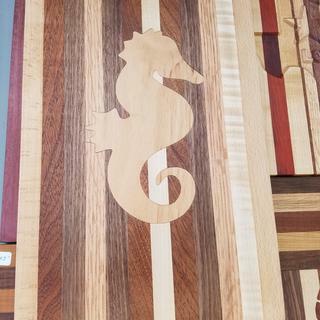 I want to learn about CNC machining and routing. This machine is upgradable to laser engraving and 3D printing. 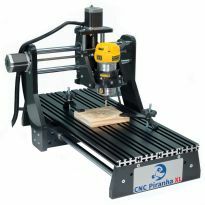 What router bits are suggested for the Piranha FX? Thanks! 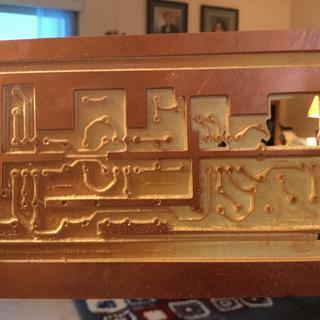 How large an area will this engrave? BEST ANSWER: The working envelope of the Piranha is 12" x 13". Could this work to personalize a baseball bat? BEST ANSWER: Yes and no. 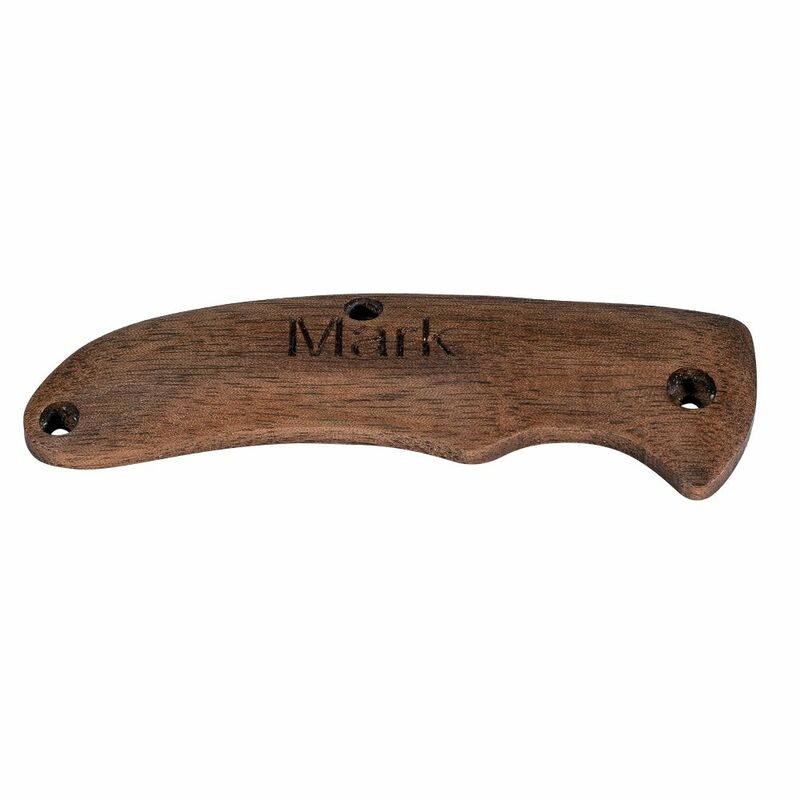 The machine is capable of engraving just about anything into any surface (provided you have correct bits). 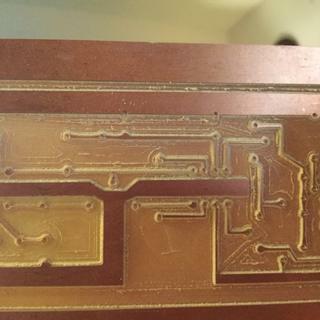 If you are doing small engraving in just one spot i think it would work well. If you plan on doing complicated engravings over a large area, and since a baseball bat is round, you would also need a 4th axis attachment, and all the bells and whistles that go with it. So to do a bat, plan to invest an additional $1000 on top of the cost of the machine. Hope this helped answer your question. How "precise" is this CNC Machine? Would it be able to cut a hole at 0.743"? Also - Will the Laser head be available for purchase separately at a later time? Thank you! BEST ANSWER: The repeatability of this CNC is +/- .001. The laser head is available as an accessory. Will there be support for Windows 10? BEST ANSWER: I have both Windows 10 and 8.1. There is no problem that I have had. It takes a little getting used to follow the correct procedures. It works fine with both. Can only speak concerning the Piranha FX I have seen the one of the Shark models using windows 7,I think. It is Vector, I believe. I use Windows 10 on my CNC shark and have no issues at all. We use ours in a production environment and has been used every day for at least an hour or two since May 2016. What is the difference between the (Piranha) and the (Piranha FX)? BEST ANSWER: The operating specifications are identical. There has been a minor manufacturing change to the router cradle to accommodate the accessories and a firmware upgrade to the controller. 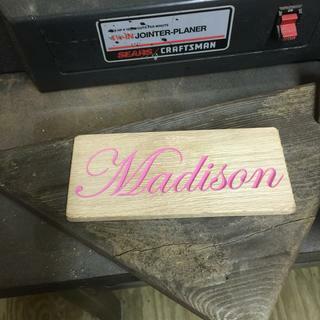 I have never used or owned a CNC machine and I am wanting to start cutting out wood monograms ranging in 12" - 20" would this machine be able to do this? If not, what machine would you recommend for someone that has never used one? BEST ANSWER: The Piranha is capable of cutting monograms and other similar projects, however the working envelope for this machine is 12" x 13". 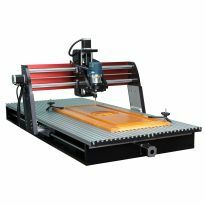 If you would like to cut larger projects in a single pass you may want to consider the CNC Shark, which has a working envelope of 13" x 24". Both machines use VCarve software and similar router and other options are common to both machines. You can evaluate the software by downloading a free trial version at www.vectric.com. You may also want to consider the new Piranha FX XL which has a bed of 12"x24"
I want to cut rectangular cutouts 1" x 2.83" in plastic enclosures. The cutout must be located accurately on the case. Will this machine allow me to do these cutouts? What is the smallest diameter cutting tool I can use? The plastic is 0.10" thick. BEST ANSWER: yes it would, the machine only has 3 inches of up/down or Z travel so you need to factor in how tall your plastic enclosure is. you can use any diameter you like, most handheld routers are going to come with a 1/4 collet, but i have an 1/8 adapter piece from amana tools, that reduces the collet down to 1/8", for the most part, the smallest bits i have found have been 1/16". but someone may make smaller, So to clarify, you only have a certain amount of height in the workspace to work with, you cant through in something that is 12 inches tall, there wouldnt be enough room between the bottom of the router and the top of the work surface. You can get a collet for the Bosh Colt that is 1/8 (.125) just do some research on line. I think Rockler has an adapter to go from 1/4 to an 1/8. Still go for the collet for tool run-out accuracy. You can get bits that go are 1/32 or finer with an 1/8 shank. Also you can get smaller pointed V-Craving bits. How do I order the laser accessory? I don't have a need for the 3D printing accessory so I don't want to purchase the full kit. BEST ANSWER: Conversion kits are currently available. David, what do you mean by "near future". It has been 4 months since your reply, but no update. That's not "near future" to me. Are the upgrades just "vaporware"? Is there a 3d printing accessory available? Is the software and the machine compatible with mac computers? BEST ANSWER: The VCarve software has been developed for, and is supported on, PC. Users have reported success running it on a mac emulator without problems, but this is not supported. I am currently running VCarve on my iMac using Parallels and Windows 7 Pro and it is working great so far. I am a vCarve Pro user you can use it on your mac using parallels. What you need is a copy of parallels which is around 70, need a fresh copy of windows 7 which is what I like best. Works perfect. So to answer your question it can be ran on a mac. 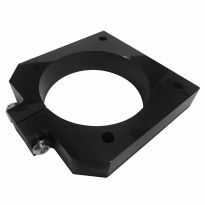 Where can I purchase CNC bits? End Mills, ball nose? Thanks. BEST ANSWER: Many places, look on internet. It appears I am not allowed to reference other stores on this site. Can this table be enlarged with an upgrade later? If I put a diamond router bit in the machine would it work for glass? BEST ANSWER: From the documentation I received with my diamond drag bit yes it should. Of course you might need to ensure you have the right tension spring installed and the proper cut depth settings, asfrom expirementing with engraving on various metals those two items can make a big difference. I have not tried to do anything on glass but will be doing some work on clear Lexan in the near future. I don't see why not. You will need to play with the speed of the cutting and depths and such, but the machine and software are extremely versatile. If you could conceivably cut it by hand with a router and a diamond bit, then you can probably do it with the Piranha Fx. Can this machine make wooden earrings and pendants? Yes. We have done both. You just need to practice. We have made pendant pieces with ours and also little shields with the CTR logo for a church. There are so many things you can make! I haven't tried anything like that, but from what I have done I would think it should be angle to with the help of the proper design software. How thick of wood will it cut like 3/4 inch to make a design? BEST ANSWER: Are you looking to cut completely thru? If so you can use a .25" up or downcut bit to cut thru. You must program it to cut the wood in several passes. It is never wise to cut thru 3/4" wood in one pass. I would program it to cut thru 3/4" wood in 7 or so passes. This is a great machine. However, it is a smaller "hobbyists" machine. If you're looking to use your machine daily and hours on end I'd suggest any of the Axiom machines. When I started out I purchased the Pirhana FX and out grew it within 10 months. I purchased the Axiom AR6 and it was paid off in 1 month I say this because most CNCers start small but then look back wishing they started a little bigger. I've cut 1 1/2 inch on most of my art work. Just make sure your settings are right. Will this work without any problems under 50 and 60 cycle power source? BEST ANSWER: Generally, most electrical systems designed for 60hz power can tolerate 50hz without any trouble. Is the FX unit fully assembled or in kit form? It is fully assembled but requires you to install the router and connect the touch panel and controller. The instructions for doing this are not ncluded and very clear. 100% fully assembled and ready to run right out of the box. You only have to plug all the cables into the controller module and install the router of your choice. For the most part it's assembled. Have add router and plug in cords. Takes minutes to ready formation. It’s fully assembled. You need to plug in some cables and of course mount your router. Sorry, Thomas, I meant to say the instructions ARE included and are very clear. It comes fully assembled. All you need to do is to plug in the modules. I have a project that will require an image to be carved at a total length of 13.5 inches. Since the total max travel of the Piranha is 13 inches, is there any way to get that extra half inch? Yes. What you have to do is called tiling. If you are using Vectric software there is a training video that will teach you how to do this. But, basically you break you project into tiles. Machine 1/2 of it and then move your project through the "Y" axes and run the 2nd portion of the software to finish the project. I've don it several times and it works well. I believe Vectric has videos/tutorials on how to do that but I believe, based on my experience, that the accuracy of the cuts you want would come down to your ability to measure and set the machine precisely.... it won’t do any of the work for you. Yes, but it is a lot of work. You have to do part of it and then step it which means you have to have a marker to hold the position for each phase of work. It is covered in the registering instructions. Thanks for the question . im relatiivy new at this however i dont know . I'd like to use this to engrave stars in the union for American Flags and add text. Will this CNC be able to accommodate this? The Pirhana FX will be able to do what your asking with no problem. I have this same machine and I am very pleased with this machine. 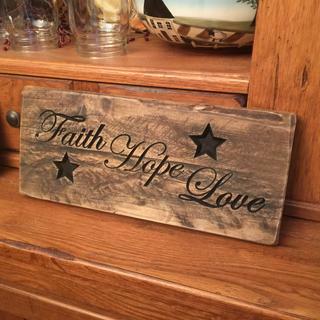 I have made about 400 personalized signs without any issues. The only problem I have is I am growing out of this machine. I am wanting to do bigger projects. My next purchase will be a Axiom. Burning (laser attachment) or routing? It can do this either way within the limitations of overall size of work area and the type of material? But still need the control program to meet the end requirements. Yes, but your image dimensions are limited to 10" x 12" (unless you do a glue up of multiple engravings). 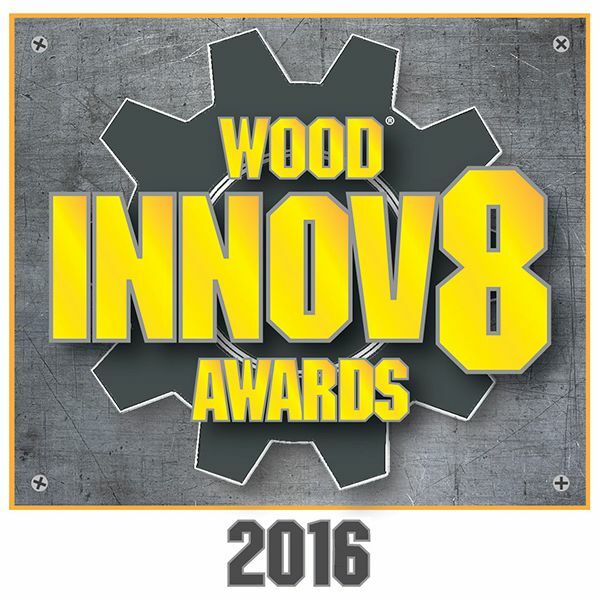 Preview your work on the V-Carve program. It should show you a preliminary look to your engraving. Should. with the correct bit. what type wood? Need good variable speed router for it... sold separate. I'm typically working with a 9" field for the stars and smaller. You will be fine if you stay below 12", if not you have to "get creative"
Awesome. Thanks for responding. 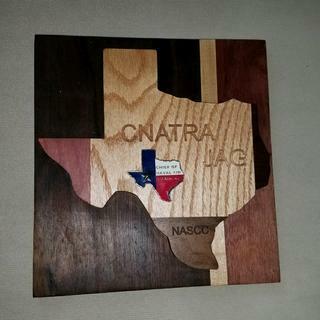 I don't have a ton of experience with CNC so I appreciate the feedback. 110 for the router and 110 for the cnc. It takes two 110 plug ins. Normal 110v that serves the USA. Can this be used for pinewood derby cars? BEST ANSWER: Yes, with a model of the 4 sides you can carve it. See pinewood cnc on u-tube. Could take awhile to become proficient at using software and mounting stock. As long as the project meets the demention requirements for the machines ability, I don’t see why it wouldn’t be able to. Most definitely, but, you'll need to look elsewhere foe any toolpaths on design them yourself. We design them ourselves. How friendly is the software for designing projects? 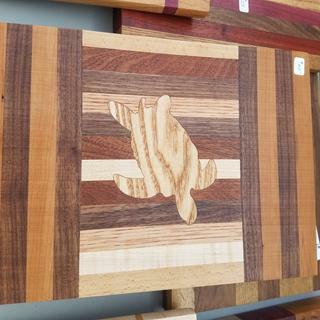 I want to use this to put inlays in cutting boards. My boards are 12 X 18. Although I would be cuttingin an area much smaller. Can I put a 12 X 18" board on the table. 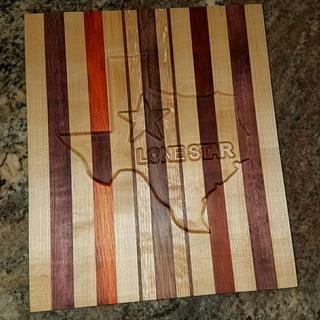 And cut a 6 x 9" inlay? BEST ANSWER: The 12X18 board will fit on the bed; however it will cover the entire clamp mounting surface, which is also 12X18. There are two through holes on the front vertical surface (on each side of Piranha Fx label) that could be used to secure some type of clamp(s). The two holes are not present on the rear vertical surface though. Yes, but you'll have to creative about clamping the board to the table since the entire bed will be covered by the board. This is the same size board I cut. I use long clamps that reach from the top of the board to under the work bench top. 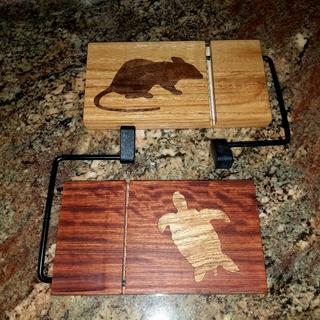 Yes you sure could, the width will clear the 12" and the length can be centered where you want to cut, meaning your cutting board can lay over the ends of the table a touch, no problem..
What is the smallest font that I can expect the machine to cut with the Piranha FX. I wish to engrave words but do not know how small a cut I can expect? BEST ANSWER: It depends on what you're engraving. I've used the Piranha to engrave control panels from sign / name badge plastic. The surface color is .003" thick, so if I set the program to cut .005" deep with a 30 degree pointed bit, the line is extremely fine. But to get this kind of depth accuracy you have to have a mounted and leveled sacrificial board. I made my board out of a commercial polyethylene cutting board so humidity doesn't affect it's thickness. I also installed 1/4" threaded inserts on the board that line up over the Piranha's slots to mount hold down clamps for the sign material using 1/4" bolts. The inserts are mounted from the bottom side of the board. You just have to be sure not to level or re-level below the inserts. The warm sunshine of the spring aspires. The dreams of heavens rays of sunshine on the leaves. The world awaits a sweet blossom an add to our lives. We touch, we reach for the joy of a new beginning. The leaf it brings us eternal hope of a mighty strong existence. And through such a short journey a life amoung us changes. The sun falls short each day a little less. Warm rays turn; a chill is in the air. Soon all is done, the cycle seems complete. The leaves they scattered randomly at our feet. But suddenly, we understand. The leaves have fallen. To which all that stands. Is memories of our love eternal never to fall from our hands. And the young girl sat under the tree as the leaves fell amoung the land. The smallest font that I have used is .4 of an inch with no problem at all. I do recommend that you decease the pass depth the smaller you go. Too deep of a pass cut can cause some chip out. The primary bit I use is a 1/4" 60 degree V-Bit. 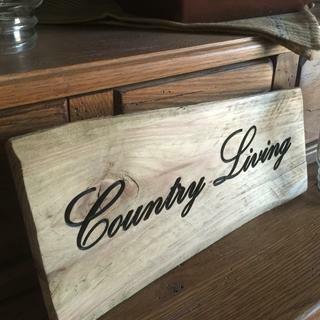 The majority of my engraving is names on my cedar furniture so it might differ on harder wood. Hope it helps. Michael, I returned my Piranha FX before actually using it because I decided that it was too small. I ordered the larger Piraña but it hasn't yet arrived. So I can't answer your question. But good luck and have fun with it. does a router come with this unit or is the an add on? BEST ANSWER: There is no router. Just a bracket for the hand held Bosh Colt as shown in the picture or a Dewalt hand held. I got the colt for mine. It was about $100. It works great for me. Speed adjustment on the router. It is an add-on. Pay attention to the make and model of the recommended routers. I got a Bosch Colt 1.0 HP and it works great with the CNC machine. No, the router does not come with this unit. It uses a palm size router. Is it standard power source or 220? BEST ANSWER: This machine runs on a standard 110 plug. Does the Piranha FX support tiling? BEST ANSWER: Yes only one way . Will this machine duplicate and existing carving? BEST ANSWER: Only if you have a digitized image that you can enter into the program. It accepts many formats of CAD output. It does not have the ability to mechanically copy from an existing carving. Nope. It makes the original cut from a file. And with that note, this is a basic machine. It's a glorified cookie cutter. And that's what I love about it. Great for 2d. It's a wonderful machine, but I have not found a way to duplicate an existing carving yet. I have bought the FX now for a year and have used it extensively, and I mean extensively! 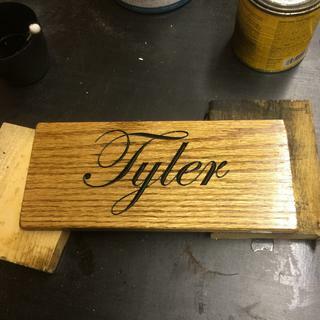 All done on 3/4" or thinner wood, on all types of wood. I have noticed that my circle cutouts are starting to become a bit oval in appearance, only by 1/32" or less but in my line of work, it means a lot. What is happening and can it be fixed by easy means. Would recalibrating the machine fix it? I need and answer soon. BEST ANSWER: Hope this helps. I did stumble on this same problem while making hotel guest room door signage. My "oval" problem was fixed by changing routers (bought a new one); at first I thought it could be the "collet" due to huge usage - but figured not to take a chance on contract and bought a new Bosch. Richie. Have you tried a different router in it? Could be that the channel for the bearings has worn more on one side. Or turn the router 90 degrees in the clamp and see if the oval rotates too. If it does, time for a new router. No new router, same Bosch handheld. I can turn it 90 degrees and see what happens. Thank you. Nextwave has given no response for over two weeks and several emails, so I have given up on them. I will look for this "lead nut" and see if it something I can fix or tighten or replace. Lot of money for something to wear so quickly. BEST ANSWER: Key question, what do you expect to use the CNC for? 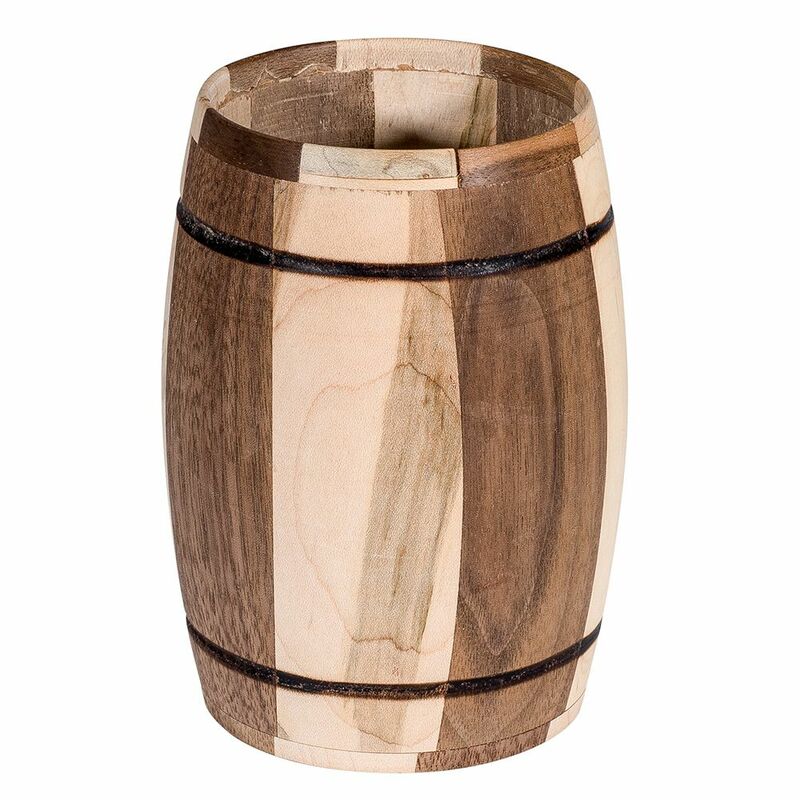 If you already have a woodworking business or decent crafting market how will it enhance your work. For me, I am just a hobbyist and sometime craftshow participant there far hard to place a value. So far though I sort of wish I had actually gone for one of the larger systems. 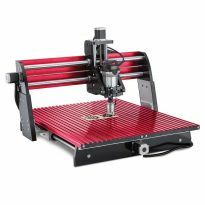 That depends on what you use it for, I am a hobbyist and my only regret is that I didn't get a larger model and yes it is a great cnc machine. very impressive. I don't think you'll be wasting you money. maybe better security and have ins. company include all your tools . What is maximum practical thickness of wood stock that is practical for carving with this machine? I am interested in carving 3" stock (a common dimension for turning blanks for example), but that 3" thickness exactly matches the Piranha FX's 3" Z-travel. Seems awfully close--do I need to subtract room for the cutting bit or anything else? Will I have to settle for carving just 2" stock? (And a similar concern--will the included clamps hold stock of 3" thickness?). My set up is 3.5" from the bottom of the Collette to the bed BUT it is possible to raise the router so some degree and it could enable you to carve on a 3" surface. 2-The hold down clamps would be troublesome as designed but possibly could be augmented by adding a block of wood between the bed and the part of the clamp that rests on the bed to give a better hold down angle/pressure on the piece to be carved but it may require longer hold down bolts between the clamp to bed. 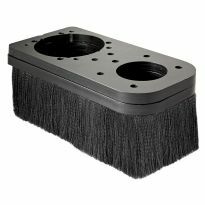 3-FYI-You need to consider some type of dust collection system as it will spew out the cut material all over the place unless you do not mind dust everywhere and have an easy clean up area. I built an enclosed box for mine, put in plastic view areas and put a port for the dust collector already in my shop but I knew that I would have to do that because I had a Shop Bot before and had to deal with the dust problem then. I downsized to the Fx because the Shop Bot consumed too much floor space for the work I was now doing. That is a lot of really great information, Les. You've also added to my conviction that a dust solution is a cost to add in. The bigger NextWave machines have a $90 dust boot available, but I'm not sure they have one for the Piranha FX, or if it's even a good idea to have such a thing always adding a tug on the gantry. I was thinking I might build a Plexiglas enclosure like you did. I'll ask about the auto-homing too because there is, apparently, another hundred-dollar plate accessory of some sort that one has to get to make the other NextWave Shark machines do that, but not mention of whether it works for the Piranha. Looks like I still have some research to do, but you've helped a lot. From my experience so far I would think that to work with a 3 inch this piece would require some very, very, exact settings. Ie. The router mounting would need to be absolutely dead on, the length of the bit being used would need to be just right. Therefore I myself would pass on that. As far as the clamps it might require a bit longer tbolts, haven't tried holding anything that high. It might be best to limit your thickness to 2". The clamps provided will hold this work.